I recently created an Instagram account (@acommunitythread) for this project and I noticed that @bendfirefighters was paying attention to my posts. In my day-to-day, I don't have many interactions with fire fighters, so I saw this as a good opportunity to get to know one. I reached out via Instagram and it was Garret on the other end. We met at a coffee shop and chatted for a couple of hours and then made an appointment to meet at the fire station for the interview and photos. Garret left a strong impression on me. He's a super good guy and one we should all feel lucky to have on the helping end of our emergencies. My name is Garret Caster. I was born in Corvalis, lived most of my upbringing in the Willamette Valley of Oregon. Through a number of different ways, I decided to move to Bend. I first came over here when I was in college and then, later in life, after I got established in my career, I was able to take an opportunity to move over here. And now, this is where we are. 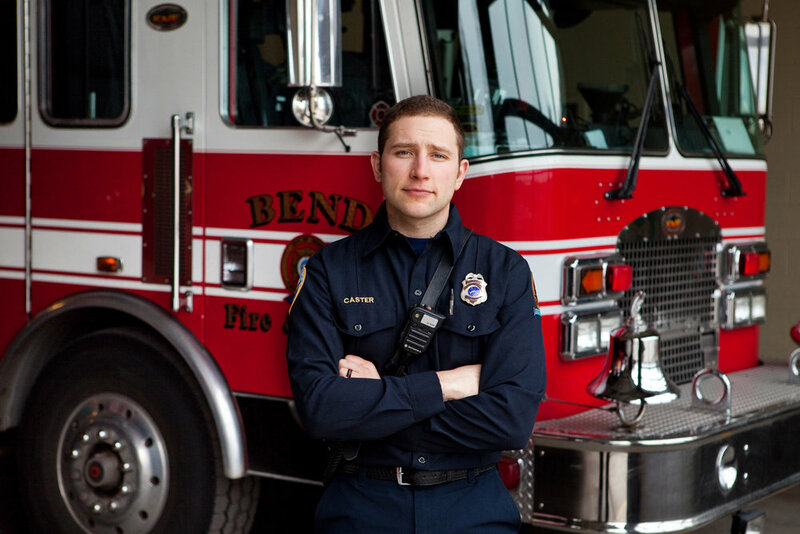 I'm currently a Firefighter Paramedic for the Bend Fire Department. When I'm not at work, I really enjoy spending time with my wife, Carlee. She does a lot of stuff with horses, so I find myself at the barn a lot, helping out. I mountain bike, I wake surf, river surf, and snowboard, and hike. Those are my outdoor activities. I try to be a good person and try to have as many experiences and laugh as much as I can. I don't know how well you know the Willamette Valley, but it rains a lot and it's gray and foggy and, for whatever reason, that just bums me out. It wasn't until I was in college that I really came over here. On a whim, I just decided to learn to snowboard. I rented a board and drove over here and it was beautiful. The air smelled clean, you have Juniper, it just smells different. People were super nice. I got over here in the evening and it had some alpenglow and it was just gorgeous. I was struck by the beauty of the area. And the people were just incredibly nice. I was kind of hooked right out of the gate. It's sunny, it's clean, it's fresh. You have all these amazing views right in your backyard. That was the first little bit of my exposure over here. I spent the next day snowboarding. Some friends we had just met let us crash on their floor and my buddy, Nick, and I walked around downtown. The city was lit in a cool way in the trees. It was kind of a winter wonderland. All of that blew my mind and made me want to live here one day. I finished up college and I knew I wanted to go to paramedic school and become a fireman. I had a little bit of a gap between when I could actually get into paramedic school and when I finished my Bachelor's degree, so I applied for a job in Sisters, Oregon. I took a job and moved there. That was my first experience discovering the community and culture of Central Oregon. And this was it for me. People are really friendly, there are a lot of people that have similar values. They value our natural resources. All the activities here. The safety of the community, the cleanliness of the community, the sustainability of the community. All of those things kind of permeated the culture here. We were hooked. Eventually, my now wife and I moved together. I was lucky enough, timing-wise, that the fire department here was hiring. I did well enough on the test - got through that. And, yeah, haven't looked back since. I work for a public service agency, the fire department. But in that, I care immensely about the people in this community and I've sworn to protect them with the oath I took. Through my line of work, I contribute by answering the call of people's emergencies and trying to help people on a really bad day. In some way I think that if I'm excellent at my job and I can help soften the blow of some kind of tragedy or someone's really bad day where they're in a vulnerable state, then I'm contributing to the life experience people get here in my community. With that, I signed up. If someone's life is threatened, I'm willing to trade mine for theirs. I'm pretty committed to what I do, the place I live, and the people that I serve. Beyond that, we try to be outgoing. My wife and I go out to a lot of different restaurants. Bend has a very vibrant culture and social atmosphere. People come to town and want to meet up, it's kind of second nature to go down to The Lot or down to the park or downtown to walk around. In that, you are having experiences and meeting new people. I don't know if it's an old-timey kind of thing, I feel like in modern day we lose kind of that small-town Hey, how are ya? Tell me about where you're from! kind of thing. If you are outgoing and friendly to people, it's a hallmark of a good community. We contribute by going out and being a part of the social life in the city. Through my work at the fire department, I got involved with a non-profit called the Community Assistance Program. When we show up to calls, a lot of times we identify other crises that people are experiencing. We show up to someone's call, maybe it's a medical emergency, and we look around the house and see that there are no groceries or they have no basic necessities. It was started by an engineer who worked here and retired not too long ago and got really frustrated showing up to calls and not being able to make that little extra difference. We got you. We're going to go back to the store and provide them with groceries or whatever they need. Or the older couple that can't keep their heat on because they're on a fixed income - we'll pay their month's utility bill. Stuff like that. For a long time it worked. It was sustained by small donations and private donations. Eventually, when he retired, that need was still there, but the effort and energy to keep it running wasn't. When I heard about it, I was pretty excited about it. I've experienced a lot of those situations where I wish I could do something else. A lot of times you can, but it's hard reaching in your pocket and pulling out your money every time it happens because it happens a lot. I started getting into this non-profit and trying to raise money for it and the community was really supportive of it. There's no overhead because we are already out doing our job. It's 100% local and you know it impacts the people in your own community. It's a pretty easy sell. We've experienced quite a bit of success funding that again. I've really been pouring myself into that because there's always going to be people that struggle to thrive and are either living paycheck to paycheck or on the streets or tucked away somewhere in society that can't get by and lack those basic items to make day-to-day life doable. We'd like to grow it to the point where we're doing quarterly projects, bigger projects for families. Instead of a hundred dollars worth of stuff or a couple hundred bucks, it's a thousand dollars or a couple thousand dollars. That's the next goal. Then after that it's to fund a scholarship for people who have a financial need or hardship that also want to get into some public service career in some capacity, whether it's being a firefighter, paramedic, police officer, school teacher, whatever. We'd like to see as much help for that out there as possible. Some of the best times I've had are just walking through downtown with my wife, enjoying a nice night with zero pressure, no commitments, as care-free as we could. Going from spot to spot, getting a little food, getting a little drink. Early fall or early summer, where it's not hot, it's not cold, and it's beautiful outside and you have that sunset painting the town orange - that's among my favorites. Hiking or snowboarding, when you're on the top of a mountain and you're just like, "This is awesome!" When they made the word radical, this is what I imagine. I've got a lot of really good memories at work. Rolling the streets at two a.m., no one else around except cops, firefighters, and street sweepers. It's pretty cool to see the other side of a city where it's just vacant. The Freedom Ride (4th of July) is always really interesting. It's the best people-watching you'll ever experience in this city. I want to see Bend grow in a way that is more sustainable for the economy, more sustainable for working class people, and I'd like to see it grow inward and upward a little bit to kind of prevent some of the sprawl. I'd like to see the city develop in a way where you don't have to commute all over town and they have kind of like boroughs. I'd like to see the city grow upwards. Some people really really don't want to see the skyscape change, but this city is awesome and it's going to keep growing. Some people get really discouraged about people coming from other cities and especially California. It's not going to stop, you might as well embrace it and just make room. I'd like to see things grow in a way that's inclusive, sustainable, and hopefully make it more accessible to regular folk like me. Moving here was terrifying. It's an expensive place to live. Housing is crazy expensive. I hope it grows in the way a lot of our trail systems and parks have, where we're just getting more and more really neat stuff that's unique to Bend. And personally, I'd like to see myself continue to grow in my department. Hopefully become more and more involved in the community. I don't know if that will ever lead to any kind of city government kind of stuff. I'd like to live closer to the mountains maybe. Or somewhere with a little more land. I'd really like to nerd out and have a little, super sustainable hobby farm with some solar panels and, knowing my wife, probably some rescue animals. Grow some hops. I'd like to become some kind of fixture in the community or the fire department and continue to enjoy Bend as home base. I'd like to travel and stuff, but I want to do that knowing that when I come back, I'm coming back to Bend, Oregon, which is pretty sweet. I guess people are just inherently uncomfortable with change, but all I've known my whole life is I'm either learning something or failing at something or trying something new until a point where it's just like I enjoy change. I enjoy new stuff. For a lot of people, it's outside their bubble, their comfort bubble. I think people see people coming from California as a threat to what Bend is like or what it was like and that's just not the nature of the world. They're making more people (sighs), it's going to continue to grow. If you really have a problem with anything, it's over-population. Bend's going to continue to grow - it's an awesome place - all you can do is keep it awesome by being nice to people. The population's growing, people want to live somewhere cool. The economy's good, so people can move. It's not like it's a secret. Visit Bend is working. We have such an abundance of things people like to travel and go do. Whether it's outdoor activities or food or an insane amount of breweries. It's not going to stop. You might as well just support your... look inwards and try and make your community your community. Make it a personable place. Make it a friendly place and safe place. People like to complain because it's really easy. It's a lot harder to have a really good attitude about stuff. I experience that in my job. You can see it in the community. It's an easy thing to complain about and also bond with someone. But at the same time, let's keep it growing. More money, more people, more passion, and power in the masses to make this place super, super cool. I don't have a problem with it. If it was a bunch of people that sucked, you know, life drains, it would be a different case. But there's a lot of wildly successful people that come here to live here. Whether they're working for themselves or remote for another business, but they saw something in this place and were passionate enough to uproot themselves and move here. So, I'm all for it.